MiMi and I have been talking about making homemade marshmallow for quite some time now. We keep getting excited about the idea of them, but never follow through. When MiMi sees mention of a candy thermometer and passes a recipe up. I have just been busy making other sweets for this event or that blog group, so I never have the time and need for sweets at the same time! 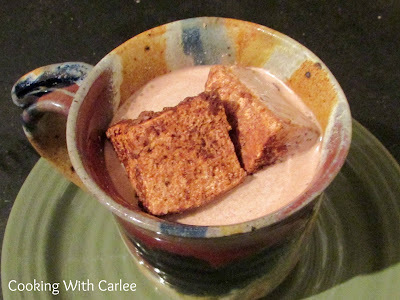 When we were putting together the idea for a hot chocolate week we knew this was our opportunity. We just HAD to make some marshmallows. We didn't want them to be just any marshmallows though. We wanted them to be extra special. 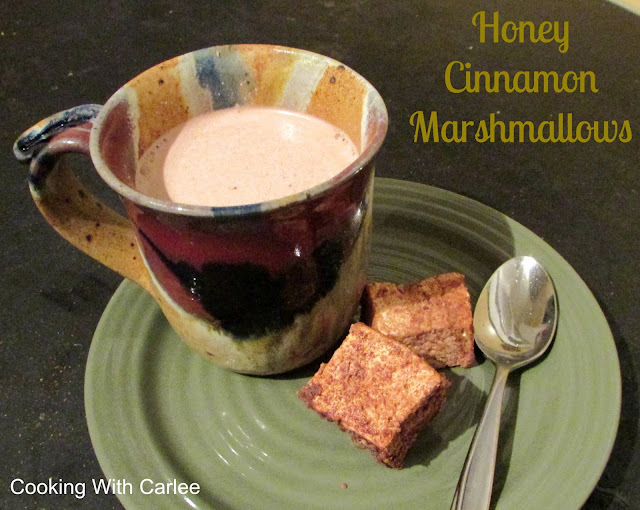 So, we took one of our favorite sweeteners, honey, and made it into marshmallows! We also added a bit of cinnamon when we dusted them. They are the perfect hot chocolate toppers. Fun enough for your inner kid but sophisticated enough to excite your adult taste buds as well! Line an 8x8" pan with parchment paper. In a small bowl, mix together the cinnamon and powdered sugar. Sprinkle half of the powdered sugar over the parchment paper in the bottom of the pan. In the bowl of your stand mixer, place 1/2 cup of water and the gelatin. Set on the mixer and fit with the whisk attachment. While the gelatin is blooming, get a large saucepan. (I used a 2 quart pan and wish I would have used one a little larger.) Mix together the other 1/2 cup water, honey, vanilla and salt in the saucepan. Bring the mixture to a boil over medium heat. Stir constantly. The mixture will get very foamy and bubbly. Continue to boil and stir until it reaches 240 degrees. Remove from heat. With the mixer on low, drizzle the hot honey mixture into the bowl. Try to maintain a very slow continuous stream down the side of the bowl. I am talking really slow people. And careful, remember how hot that honey is. Turn the mixture to high and beat for about 15 minutes. It will go from a sad looking bowl of slop into a big bowl of fluffy white goodness. 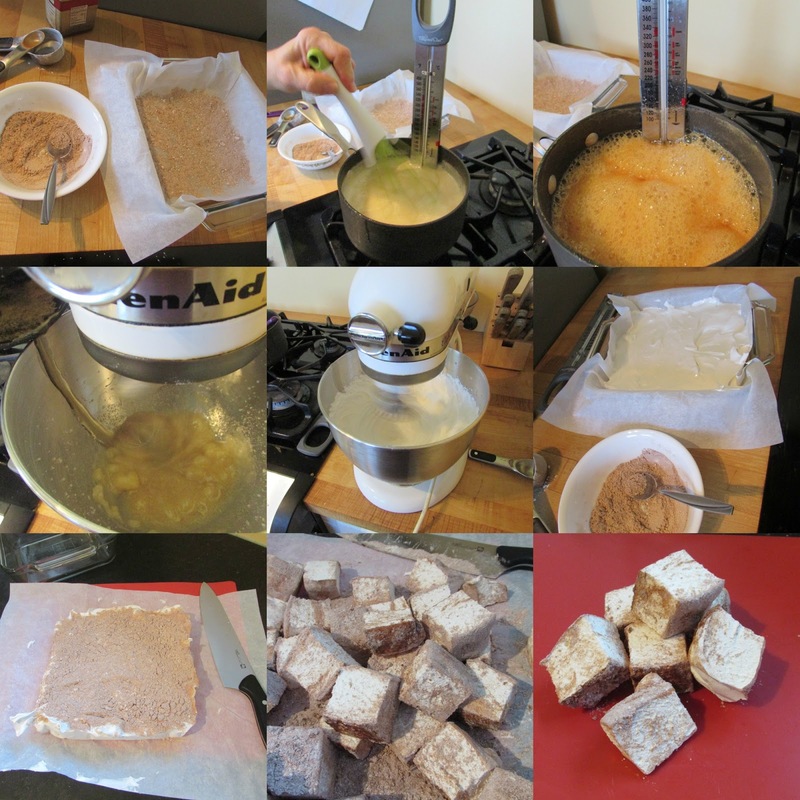 Scoop the marshmallow mixture into the prepared pan and spread as smoothly as possible. Sprinkle the rest of the powdered sugar over the top. Allow to set at room temperature for at least 12 hours. Using parchment paper, remove from the pan. Slowly peel the parchment off the marshmallow. Cut into desired size pieces. Toss marshmallows with whatever powdered sugar is still loose. Store in an airtight container. You can toss with additional powdered sugar or corn starch if they start to look sticky. The making of marshmallows is very much like making candy. I usually avoid any recipe that involves a candy thermometer. The only recipe I was unsuccessful at making when taking cooking class in college was a candy recipe. That's why I have ignored the tug to make marshmallows for several years. When Carlee mentioned getting together to make hot chocolate mixes I knew It was time to face my fears. (I'll do things for my kids that I would not do for myself). Little did I know that a good candy thermometer makes it so easy. When I get one like Carlee has I will be excited to try my hand at more candy making. I'm ready to play hard ball now! You are so punny MiMi! I wondered if you would catch that. I made marshmallows just once, and there were lots of kids and mess involved, but that "cured" me from another try - these look so incredible though, I might have to have another go! Thanks for sharing this on Throwback Thursday, I'm pinning it to our pinterst board! Ha! 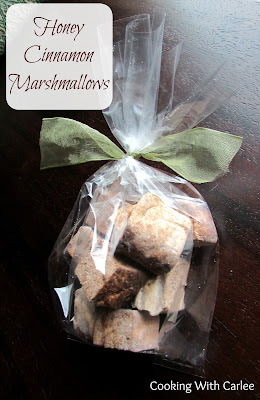 It seems like making marshmallows would be a kid friendly activity, but it really isn't! Try them again on your own. I think it will go a lot better. Thanks for hosting! Oh my goodness these look decadent but what a lovely gift idea. Thanks for joining us Carlee at our very first #OvertheMoon linkup. It is great to have you join us and look forward to seeing you next week! They were so much fun to make! The whole house smelled of honey. It was fabulous! Congrats on the new party, I am looking forward to more of them! These look so good Carlee! I'm think a Hot buttered rum with the cinnamon & Honey!! Yummy! Thanks for sharing on My 2 Favorite Things on Thursday! Hope to see you again! Pinned! Oh my, that sounds amazing! Thanks for hosting, see you Thursday! Carlee, you came through with another awesome temptation for us here at the Blogger's Pit Stop. I have never heard of marshmallow with those flavors. I love cinnamon. Whatever your blogging goals we hope you have found a piece of knowledge here that will help you going forward. Thanks so much Kathleen. It seems like there is always so much to learn. Delish. Thanks for joining us at #SaucySaturdays. Such a neat idea and these look so delicious! They are delicious and they smell so good! Thanks for hosting! These look delicious, and not too difficult to make! I bet they would be good in so many wintery drinks! Thanks so much for linking up with us at the Best of the Blogosphere! They really weren't hard at all, they just take a little bit of time and they are worth it! Thanks for hosting!